Applebee's is celebrating the holidays with $1 Long Island Iced Tea for the entire month of December. Known as the Dollar L.I.T.™, the fan-favorite cocktail is made with a delicious new mix of vodka, rum, gin, tequila, triple sec and sweet & sour mix with a splash of cola. 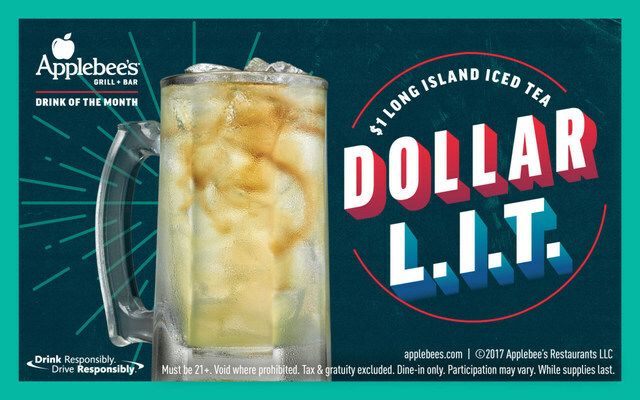 "The Dollar drink is back at Applebee's just in time for the holidays, and this time, folks can enjoy a $1 Long Island Iced Tea," said Patrick Kirk, vice president of beverage innovation at Applebee's. "The Dollar L.I.T. is kind to your pocket book and a great drink to share with old friends and new ones this holiday season." The Applebee's Dollar L.I.T. is available all day at participating Applebee's restaurants nationwide every day in December – for only a buck! For more info, click here .